Guys. Guys guys. 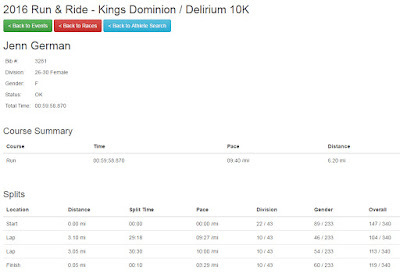 I ran a race in an amusement park and it wasn't runDisney. Last Sunday, the ever-popular, ever-magnificent Elizabeth and I got up at 4:30am and drove down to Kings Dominion amusement park in Doswell, VA. The hour-and-a-half-sans-traffic trip went smoothly, and we arrived in plenty of time to pick up our packets and prep for our runs. The morning included a 10k, a 5k, and a 1 mile fun run, with me slated to run the 10k and Elizabeth the 5k. Packet pickup was quick and easy with no line despite it being the morning of. Packets consisted of pretty much just a bib and safety pins, the included park ticket, and a shirt - a short-sleeved tech tee (YEAH!) for the 10k-ers and cotton tees for everybody else. I also received a "Fastpass" equivalent in my packet, but Elizabeth did not; uncertain if that was an error or a 10k-only thing. This was all good and simple. The bad bit: the weather. Late May or no, the morning highs were in the low-to-mid 50s with on-again-off-again rain. Needless to say I wore long pants and a long-sleeved shirt. BUT I WASN'T HAPPY ABOUT IT. The start area was by the picnic pavilions, and the race stepped off in stages, with the 10k starting at 7:40am, the 5k five minutes later, and the 1 miler at 8:30am. That's about where my knowledge of the 1 miler drops off, but I do know the course for both the 5k and 10k were precisely the same - the 10k people just looped it twice. I don't love that kind of setup, but since both loops were entirely within the park I was willing to go along. The races weren't large enough to warrant waves or corrals, but it was chip-timed. We lined up, they counted us down, and we let fly, crossing into the park within a couple of yards. The course began at the front of the park, dubbed International Street and dominated by Parisian fountains and a one-third scale replica on the Eiffel Tower. We breezed on past that and I think into Old Virginia? I'm not 100% remembering how we got to the next part. I know exactly what that next part was, though: DINOSAURS ALIVE! Then if I remember correctly we took some service roads or some such into the Soak City Water Park section, which was rather hilariously staffed by lifeguards. Oh yes, I'm definitely going to try to sneak a dip in the wave pool because I'M NOT ALREADY COLD AND WET ENOUGH. Rain: The Water Park That Follows You Everywhere And Will Not Be Denied. Next up was I believe Candy Apple Grove followed by Safari Village followed by the admittedly adorable Planet Snoopy (did I mention Snoopy was there? No character ops on the course though, sadly). Then, if you were running the 5k, you made it back to the picnic pavilions and the finish! Or, if you were in the 10K: REPEAT. It really wasn't that bad. I wasn't in super great racing shape, a combination of my own stupidity (lack of hydration; forgetting my snack) and one of my knees deciding to act up slightly, but it really wasn't that bad. Like I said, the dinosaurs were fun. The rain slacked off during the second time around. and after all, I knew I only had another 5K to go. No sweat, right? What surprised me a little was the traffic. This being a shared course, I started passing not just 10K people but 5K people, as early as something like 3.25 miles. Don't get me wrong - I'm not about to speed shame anyone; getting out there and doing a 5K however slowly is a helluva lot better than not doing one at all - but I'm glad the race organizers capped the 5K at a small enough number that I never had to dodge slower participants. There was always plenty of room (with the exception of the start) and I therefore advise the race organizers, wherever they are, to keep the numbers steady. The finish was fun, with plenty of cheering crowds and an announcer calling names at the finish. The volunteers distributing medals were so enthusiastic I was still in the process of slowing to a walk when one was handed to me! What was weird was that my GPS came up pretty short: it registered 5.95 miles at the end, including a little bit of extra where I started it slightly early/stopped it slightly late. Odd. Here are my official stats, anyway, since they look more impressive. I found Elizabeth, who had finished her 5K when I was just starting mile 5 (recap from her coming!). We hopped in the food line, which was nicely stocked with PowerAde and water but rather disappointing the food department: un-toasted bagels and cream cheese or nada. We took them because we were hungry, it was all rather cold and boring. Probably the area that could use the most improvement. After our sad breakfast we changed in the bathrooms (real bathrooms! I love amusement park races) and got ready to enter KINGS DOMINION! Elizabeth and I will give you a full rundown of our park experiences at a later date. In short, I wouldn't say this is a must-do race for me, but I'll consider it next time it comes around assuming the prices don't skyrocket. Especially if we're promised better food. And weather. C'mon, May, get it together. Have you ever run a non-Disney amusement park race? It looks fun - I like the medal! Still hoping to do one of these races at some point. Dorney is closest for me but I've never been able to swing the weekend that they have it. I hope you make it someday! All the other parks seem to have half marathons available, too. Maybe Kings Dominion will add one next year.